The shortlists for the 2013 CILIP Carnegie and Kate Greenaway Medal were announced earlier this week in the UK. There are some impressive titles on the shortlists and I’ll have to get reading to catch up on the ones that I haven’t already read. 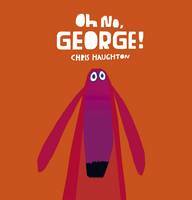 I’m glad to see some of my favourite books on the lists, including Wonder, Oh No, George! and I Want My Hat Back. Check out the lists below and I’d love to know what your favourites are. The Carnegie Medal, awarded annually, was established in 1936, in memory of the Scottish-born philanthropist, Andrew Carnegie (1835 – 1919). A self-made industrialist who made his fortune in steel in the USA, Carnegie’s experience of using a library as a child led him to resolve that “If ever wealth came to me that it should be used to establish free libraries.” He set up more than 2,800 libraries across the English speaking world and, by the time of his death, over half the library authorities in Great Britain had Carnegie libraries. The Kate Greenaway Medal was established in 1955, for distinguished illustration in a book for children. Named after the popular nineteenth century artist known for her beautiful children’s illustrations and designs, the CILIP Kate Greenaway Medal is awarded annually for an outstanding book in terms of illustration for children and young people.